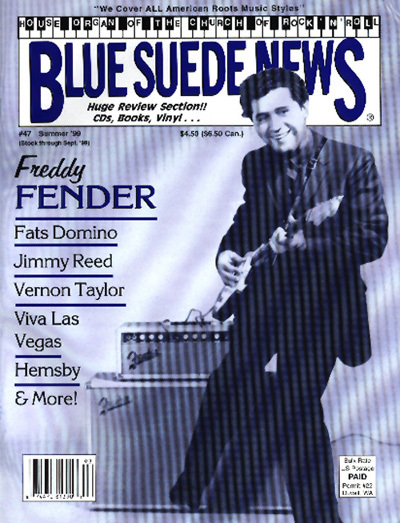 Blue Suede News #47: Freddy Fender, Fats Domino, Jimmy Reed, Vernon Taylor, Viva Las Vegas, NOLA Jazz Fest, Rockabilly, Blues, '50s Rock'n'Roll! Issue #47 - Summer 1999 - Scroll down to order!! Blue Suede News #47 has many feature articles including one on Tex Mex legend Freddy Fender from his roots as "El Be-Bop Kid" in the fifties to his Hollywood walk of fame star. There is an extensive Fats Domino story "The road to stardom runs through New Orleans" and a review of the New Orleans Jazz and Heritage Festival in 1999. Another extensive article is about blues master Jimmy Reed and Sun records Rockabilly recording artist Vernon Taylor. The Viva Las Vegas Rockabilly show on the Easter weekend 1999 is featured with a review and lots of cool photos, Janis Martin, Mack Stevens, Kim Lenz, Marti Brom, Hal Peters, Curtis Gordon, Jack Baymoore, Mac Curtis, Sonny George and others performed. There is a review about a Brenda Lee show in Oregon and the Hemsby Rock'n'Roll weekender in England with Glen Glenn, The Treniers, Narvel Felts and others.